If you follow me on social media, you probably know that I recently got accepted into the Science of People Body Language Trainer Certification program. I'm a Body Language Trainer-in-Training. It's such an honour to be taught and mentored by Vanessa Van Edwards! One of the first things my fellow trainers and I did in the program was rate ourselves in 6 areas: First Impressions, Presence, Lie Detection, Perceptiveness, Leadership, and Charisma. These 6 areas are what Body Language Trainers help our clients improve on. I will discuss other areas in a future blog, but for now I want to focus on Presence and Charisma. There are many PWS who hide in shame, and hold back what they want (or need) to say, and many of us think we can never have great Presence or Charisma in social situations, dating or work situations - and that's because many PWS focus excessively on their words - the verbal content of their message. What we often forget (or don't know), is that between 60 to 93 percent of communication is NON-VERBAL, and a huge part of Presence and Charisma is our Body Language. I gave myself a 2.5 out of 5 for Presence and a 3 out of 5 for Charisma. I thought my ratings for my own Presence and Charisma were accurate, but it turns out I was wrong. I had my Welcome Call (on video chat) with Danielle Baker, Certified Body Language Trainer (and lead trainer/mentor of the program). After the call, I emailed her the next day and asked her if I was too hard on myself on my Presence and Charisma ratings. "...presence and charisma are really all about the subtle cues of body language like mirroring and the power of touch"
"It was really nice chatting with you too--glad we were able to connect. I definitely think you're probably a little hard on yourself with charisma and presence--you were funny and charming on our call together!" I think the reason why I rated myself low in those 2 areas at first was because I was unsure of what Presence and Charisma is - I wasn't aware of how much Body Language played a role in those 2 areas. Charisma is how memorable, warm, and competent we are, if we're interested and interesting. Charisma is all about finding a balance between Warmth and Competence. This is important because if you're too warm, you could be seen as a pushover, and if you're too competent, you could be seen as cold. A few methods to be more charismatic is the use of hand gestures, using high power body language, and being more expressive with both your voice and hands when speaking. If you're a person who stutters, you might be thinking "Brian's a confident person who stutters, but having good presence and being charismatic is too hard for me! I don't think I can level up those areas." But remember, anything worth working for is going to be challenging. Discomfort is a sign that you're growing and improving. I wasn't always confident - you can't become confident or charismatic if you never do things outside of your comfort zone. Just like anything else, improving your Body Language takes practice. What I've said here is only the tip of the iceberg - there's SO MUCH more about Body Language to learn and to teach, and all of it is relevant to people who stutter, or to anyone who wants to be given the power to feel FELT and HEARD. I've been talking about launching a website for a while now, and my website/blog is now officially open on National Stuttering Awareness Week 2016!! For my first post, I'd like to explain "Stuttering Loudly" and what this name means to me and the significance of it. 1. A few people have misunderstood the name and thought that it means deliberate talking loudly or raising my volume. No, I don't deliberately speak with a raised volume. I speak with my natural voice, and if/when it comes out loud, I'm like that naturally. 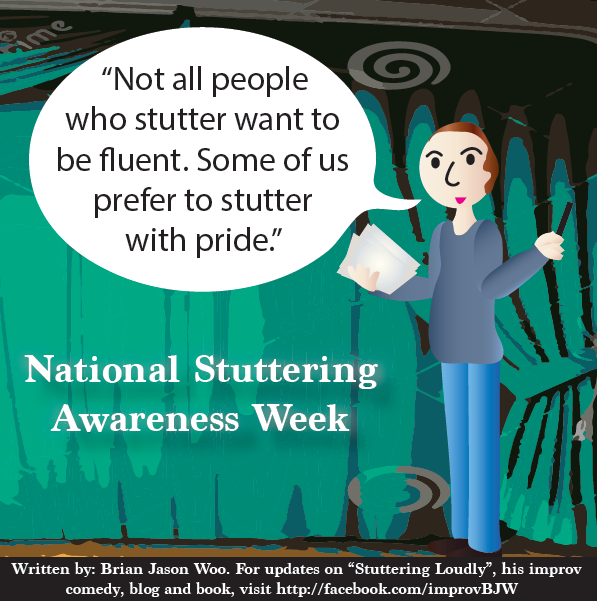 I've heard on some Facebook stuttering support groups that people who stutter (PWS) should deliberately speak louder, and this might increase their fluency, but that's not why I have a loud voice. I don't notice much difference in my fluency when I speak loudly (or speaking with my natural loud voice). 2. Some have wrongly assumed that "Stuttering Loudly" means annoying people and being obnoxious by deliberately speaking or "stuttering loudly" in public. No, purposely annoying others is something I would never approve of. I decided to re-name and re-launch my online presence and call myself "Stuttering Loudly" because I've been told that I have a loud voice. And I still stutter when speaking at this volume, which is the "theatre voice" that I learned from my 5 years of doing improv comedy. Before improv, I used to be extremely quiet and I would barely speak. My loud voice is learned, but it's also become very natural to me, and I don't even think about it. I don't need to raise my voice deliberately. Another reason why I chose "Stuttering Loudly" is I know that too many people who stutter are living in shame and hiding their stutter and avoiding speaking situations. 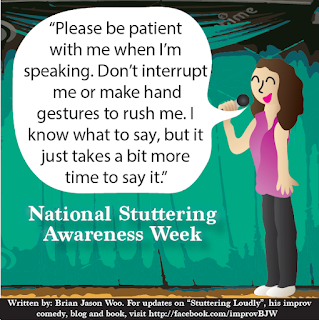 "Stuttering Loudly" to me, means stuttering with no shame. It means stuttering with pride. There's nothing wrong with you just because you speak differently. 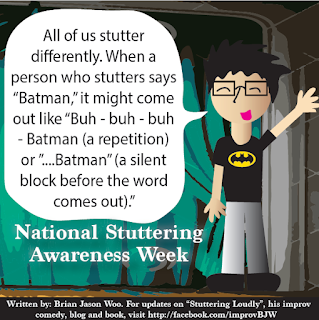 Stuttering is just a trait, everyone is different and we all need to be accepting of people's differences. We're often accepting of everyone else's different traits, why not accept our own? Or even embrace it? "Stuttering Loudly: A journey of faith, hope, pride, and growth" will be the name of my upcoming autobiographical comic book (drawn by Sarah M Stories) based on my personal experiences with stuttering. It's still in progress but I will talk more about it in a future blog. 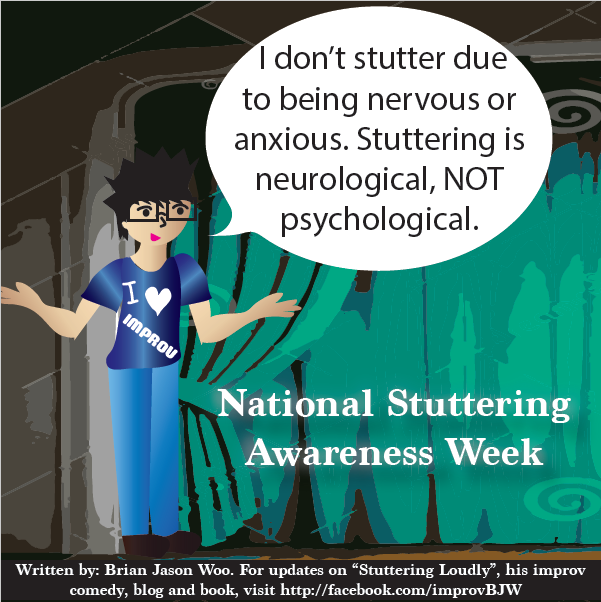 It's National Stuttering Awareness Week, and many people who stutter are too afraid to raise awareness or even talk about stuttering because they have been living in shame and embarrassment for their whole lives. There's so much we can do to help fluent people understand us more, and people can't understand us if we hide. Whether this is the first time you've heard of me, or you've been following me for years, feel free to look around my website; I've updated my bio in the "About" section. Happy National Stuttering Awareness Week! !